This top secret build hasn’t been on the blog for a while, but that doesn’t mean that it hasn’t been getting worked on. This awesome looking cart is on the home stretch and it is all starting to come together….see for yourself! We started off by doing some suspension modifications…somethings we even keep secret. Wit the mods made we were able to tuck the 14’s under this Precedent. How cool is this mean machine looking! This cart is going to turn heads everywhere it goes and we know our customers are going to be smiling from ear to ear! Next we installed the floor cover and ran the final wiring. Then we installed the floor mat to finish off the footwell area. For night time visibility we installed some LED taillights. How about another look at how cool this paint is! Check out the sweet sweet stance on this cart! It really is hard to beat 14″ chrome rims. 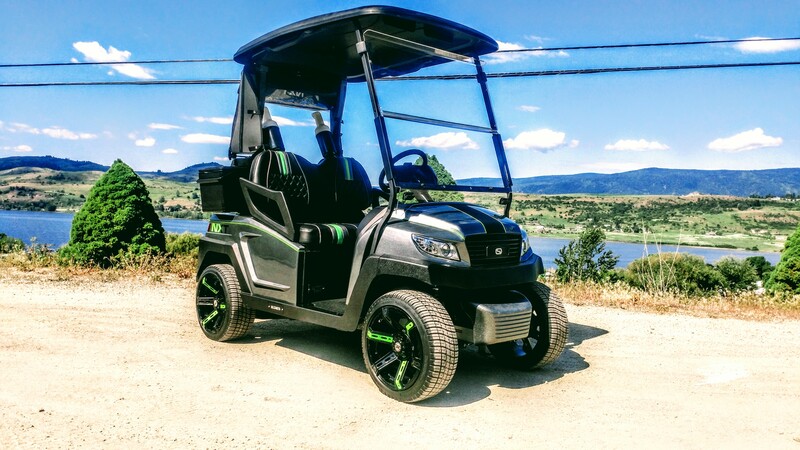 Also notice the LED headlight, this will light up the trail home from those late night cruises out to the Look out Cabin at Predator Ridge. Well that’s enough excitement for one post, there are only a few final finishing touches to go onto this cart and it will be ready for it’s new home at Predator Ridge. While your at it, be sure to swing by our SC Carts Facebook page, there is always a ton of fun going on there.